Q&A with Jill Delaney, PhD. 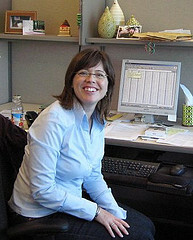 Jill Delaney at work, Library and Archives Canada. David B: Tell us a bit about yourself–would you describe yourself as a ‘forest historian’? If not, how did you come to be involved with forest history? (now the Mountain Legacy Project). Dr. Eric Higgs, then at the University of Alberta, was trying to obtain copies of historic phototopographic images taken in Jasper National Park and other mountain sites by M.P. Bridgland for the Dominion Land Survey. We had acquired a very small number of images from the larger survey in the 1970s, but most of the glass plates were still under the custody of Natural Resources Canada. I arranged the legal transfer of the rest of these images – more than 60,000 glass plate negatives dating from 1887-1958 – from NRCan to the (then) National Archives of Canada. We then negotiated a more formal (and ongoing) partnership with MLP and the University of Victoria to provide high resolution scans of the plates as well as descriptions of the images which they could use in their repeat photography project. In turn, the project has provided resources for LAC to house this valuable and fragile collection properly, and to continue to conduct research into both these images and related archival collections. The image pairings are used by academics, graduate students, as well as forest management professionals to conduct a wide variety of analytical and comparative research on changes in a particular geographic area of interest. Other partners in the MLP include Parks Canada and Alberta Sustainable Resource Development, as well as The Alberta Library. In 2008 we discovered that the British Columbia Museum and Archives holds a similar collection of images covering a large part of the mountain geography of that province during a similar period. 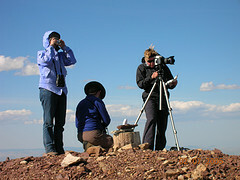 Jill Delaney, Eric Higgs and Trudi Smith near Waterton Lakes National Park. Photo Credit: Rob Watt, Retired Park Warden. How has the Mountain Legacy Project helped to change your thoughts of photos as an historical source? sources or activities, it is also unfortunately the case that most scientists do not look to our collections as a source for scientific data. I sense that this is beginning to change a bit now, as scientists in general become more interested in using alternative sources of information for historical data, for example, farmer’s journals as a source for historical weather data. Most archivists come from a background in history and cultural history, rather than the sciences, and so we either tend not to think of our collections as a source for scientific data, or we are somewhat nervous about assessing and selecting scientific records as we feel out of our depth in understanding the content, and possible long-term research value. I became excited about the prospects of the phototopographic images because I was approached by someone, Eric Higgs, who already had a deep interest in them, and because I soon saw that they would be of value to a wide variety of researchers, from forest management professionals, through people studying climate change, as well as ethnologists and landslide experts. Also, did I mention I love being in the mountains, and when I can’t be there, I love looking at the spectacular photographs these amazing surveyors produced over more than 60 years! The partnership with MLP has been a great opportunity to actively work with a diverse group of researchers who are always looking for new ways to extract data from the images for their research. What challenges does this pose for the archives? be of value to scientific researchers. Having said that, I should mention that there is now a Special Interest Section on Scientific Records within the Association of Canadian Archivists. This group is concerned precisely with the issue of better understanding the archival and historical value of scientific records, and of disseminating their research to the archival community in Canada. The survey photographs were initially created to produce topographic maps across the country. They were considered as intermediate, temporary documents needed to create the maps. Somehow, however, the plates, and many of the contact prints and indices created from them, were kept over the years, perhaps because scientists within NRCan were hesitant to dipose of them, and did very occasionally, consult them. In the end, the MLP found copies of prints and indices that had been distributed to Jasper National Park, and that led them to NRCan, and finally to LAC. The MLP is now using these images in a completely different way than their creators imagined, and that is a good lesson for archivists, historians and scientists. Nonetheless, the archiving of scientific records poses serious challenges to archives and archivists, not least of which is the vast amount of data created by scientific projects, and the understanding of what may have archival value. The original images from the DLS posed a physical challenge to us, as they sit on glass plates, and require special housing and handling, and also a lot of shelf space. However, many more contemporary scientific projects produce reams of numerical data saved on tape or disk, and you can imagine the challenges in both accessing and preserving material like this, especially when resources are stretched. Describe the range of photographs that you encounter in your work as an archivist at Library and Archives Canada. The mandate of Library and Archives Canada is to acquire, describe and make accessible the documentary heritage of Canada, in any format, including photographs. As a result, our collection of more than 25 million photographic images is extremely wide-ranging, in terms of both content and format. We have daguerreotype portraits and views from the 1840s, digital images acquired last year, and everything in between. The collections come from the federal government (as with the Dominion Land Survey images), and private organizations and citizens. We work to develop a collection which will visually document the diverse aspects of Canadian life and society, from historically important Canadian people, events, places, and activities. For example, the Andrew Merrilees fonds contains hundreds of thousands of photographic prints and negatives documenting the history of rail transportation in Canada since its beginnings in the 1850s into the 1970s, while the smaller Vincenzo Pietropaolo fonds documents the everyday lives of migrant farm workers, Toronto’s Italian community, and the shifting identity of workers across Canada in the 1990s. We also hold other collections related to forestry and forest history, including some which document lumber operations in the Ottawa Valley in the early 20th century, the work of the Canadian Forestry Corps in the First and Second World Wars in England and Europe, a collection of NRCan slides documenting insect and disease infestations in central Canadian forests, as well as other related collections from the Ministry of Forestry, the Geological Survey of Canada and Parks Canada. For more background, consult: Jill Delaney (2008). “An Inconvenient Truth? Scientific Photography and Archival Ambivalence” in Archivaria, issue 65, pp 75-95.